Sadly there’s so much unrest in the world. We turn on our televisions to catch the latest breaking news. We are left to wonder, how do we begin to be a part of the change? A whole generation is used to having information, services, and products available immediately. How do we re-educate our youth? It’s time to take a moment, be thankful for the small things. We are all guilty of taking things for granted. This Thanksgiving we had an idea! 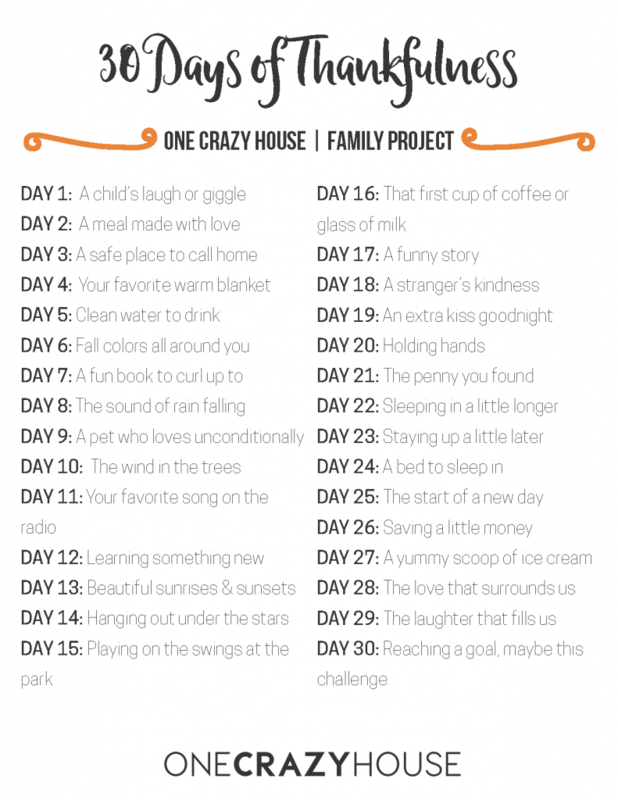 We came up with a family project, challenging ourselves to 30 Days of Thankfulness. Do this family project throughout the year, because you don’t have to wait for Thanksgiving or the holiday season to celebrate thankfulness. Random acts of kindness are a great way to teach your children about giving. However, we have to balance that with a sense of gratitude. There are two free printables available, a pre-filled version with 30 things to be thankful for and a blank one. I encourage you to print both. Sit down with your children, it doesn’t matter if they are toddlers or teenagers. Talk about some of the things listed in the pre-filled version. What are some of their favorites? Ask open-ended questions to continue a fun discussion, but don’t be surprised if their answers are more insightful than your own. Their minds are young and see the world so differently. If you have older children, challenge them to fill out their own list. However, make sure to keep one to work on as a family. Like any good or bad habit, it usually takes about 30 days for it to sink in. Being thankful and discovering the blessings isn’t a terrible habit to develop. On days, where my daughter starts a streak of complaining, we usually stop and ask her to tell us 5 things that she’s thankful for. But, it’s easy for us to do the same thing when we run into challenges. Haven’t you run into a few friends that constantly unload all the things that are going wrong in their lives? Yes, I’ve run into them too. I have to bite my tongue to avoid asking them the same question I ask my 9-year-old. Maybe you can print out a sheet for them too! It’s just a printable! Yes, it is, but can you imagine looking back and reading through all of them? Maybe young Jaxon was thankful for warm chocolate chip cookies and milk. Suddenly, you blinked, teenage Jaxon is thankful for getting into college. Heartstring, oh yeah I pulled them. 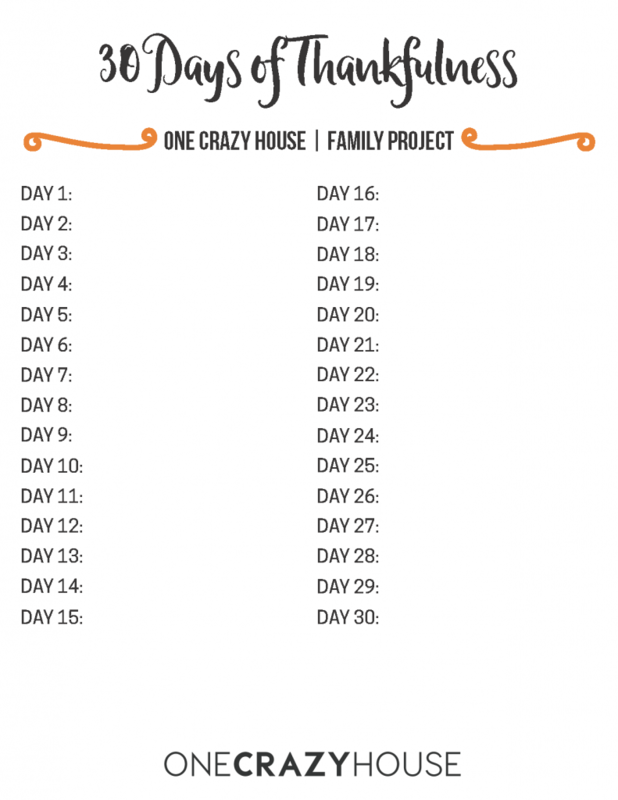 This family project will go beyond the 30 days of thankfulness if you let it. They will create years full of memories! 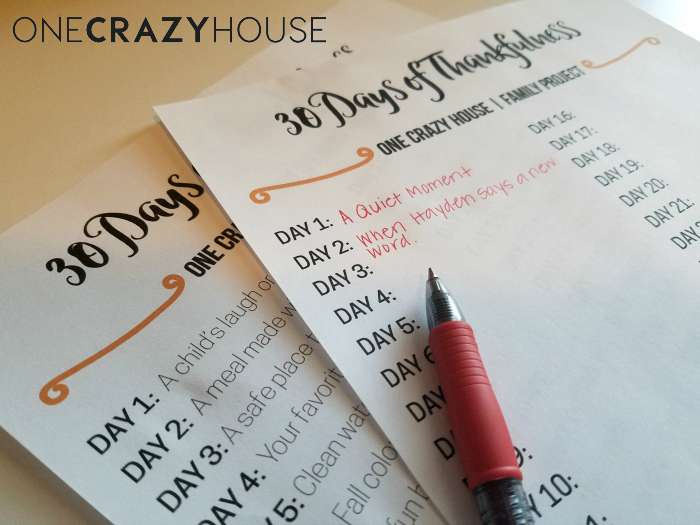 So, print out your 30 Days of Thankfulness worksheets (pre-filled and blank) and start a fun and memorable family project. The time spent together and the lessons learned is worth it.